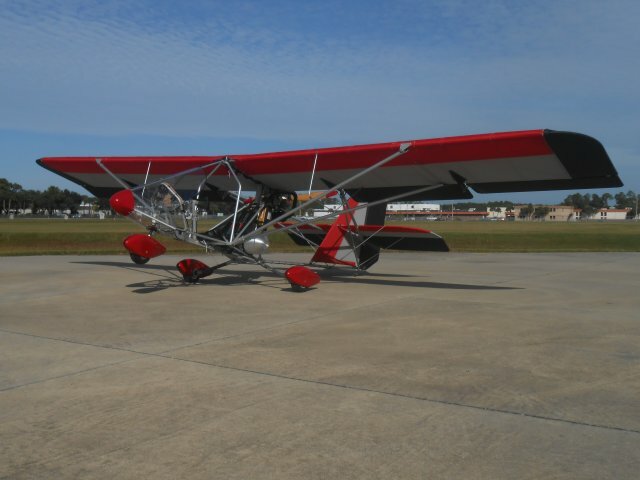 The Aerolite 103 is available as a professionally built, ready-to-fly, legal Part 103 single-seat ultralight aircraft, or as a Quick-Build Kit that you can assemble yourself. Complete airframe, featuring your choice of sail color(s), Nose Fairing & Windscreen, Electric Flaps, Shock Absorbing Main Gear, Steerable Nose Wheel with Suspension, Four-point Restraint System, 5 Gallon Aluminum Fuel Tank, Visual Fuel Quantity Gauge, Dacron Covering, Azusa Brakes, and a Fully Anodized Airframe. All Factory Built Ready-To-Fly Aerolites include all of the above, plus Engine (see engine choices below), Reduction Drive, Electric Start, Lightweight Lithium Starter Battery, 2 Blade Culver Prop Propeller, Instrument Panel with flight and engine instrument (airspeed, altimeter, slip indicator, tachometer, EGT, CHT). All engine packages include the engine, carburetor, engine mount, pre-welded exhaust, exhaust mount, mounting hardware, reduction drive, throttle cable(s), choke cable(s), electric starter, lightweight lithium battery, and complete instrument package with flight and engine instrument (airspeed, altimeter, slip indicator, tachometer, EGT, CHT). (Manual start is standard on Kawasaki engines, and electric start, with lightweight lithium battery is available as an option). (Rotax no longer makes new 447 and 503 engines. All Rotax 447 and 503 engines are rebuilt or low time engines that have been disassembled, inspected and reassembled by a Service Center). All Hirth and Kawasaki engines are new motors that have no prior run time. Although the Aerolite can easily be built and flown with an empty weight well below those specified in FAR Part 103, certain engine configurations and/or the addition of various upgrades and options may result in the aircraft having an empty weight above those specified in Part 103. Get Your Aerolite 103 Hats Here! Copyright 2019 U-FLY-IT Light Sport Aircraft, LLC. All rights reserved.